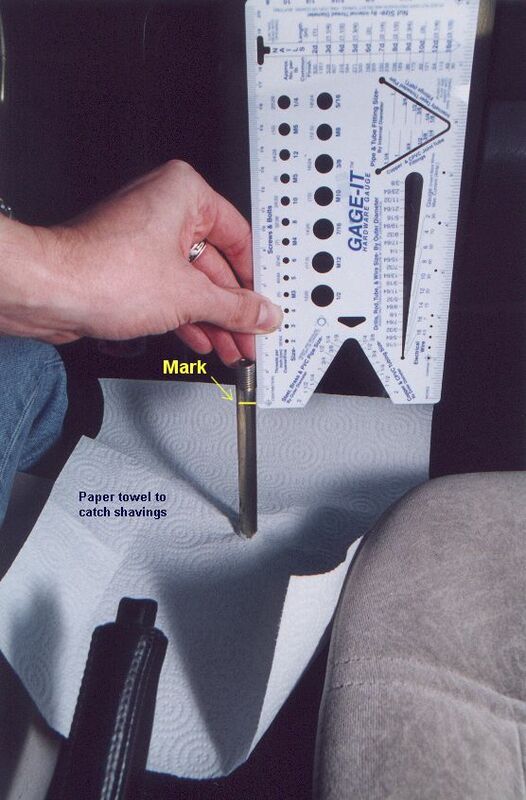 This is a simple and quick modification that will shorten the length of the shifter. This will NOT shorten the actual throw like a short throw kit, it will only shorten the height of the shifter and the distance the shift knob travels. Remember, this is a permanent modification so only take off a little bit at a time and test! The first thing to do is put the car in neutral. 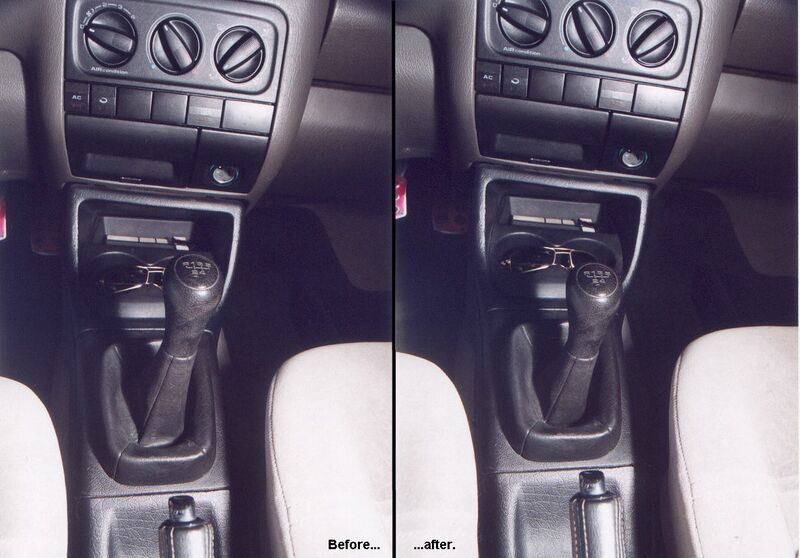 Next, unscrew the shift knob then pop off the shifter surround base from the center console. This is easily pryed off with the help of a flat bladed screwdriver and pulling up with your fingers. 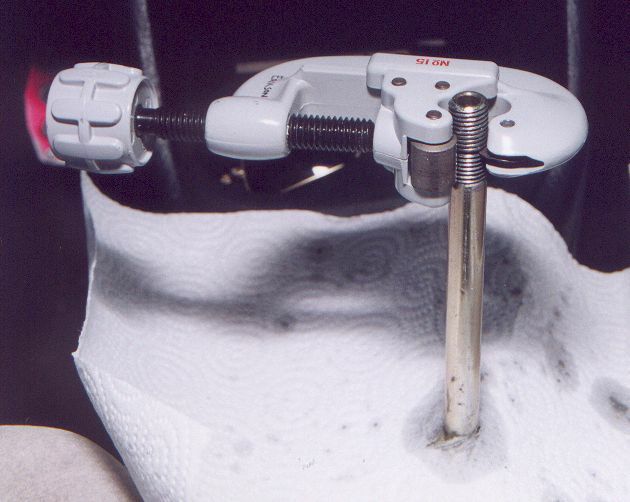 Now you want to put something down to protect the shifter base from becoming clogged with debris when you are cutting the new threads on the shifter. I used a paper towel but a piece of cloth would probably be a better idea. Clamp vice-grips to the shift shaft and hold them while cutting the new threads. This will keep the shift shaft from turning and breaking anything. 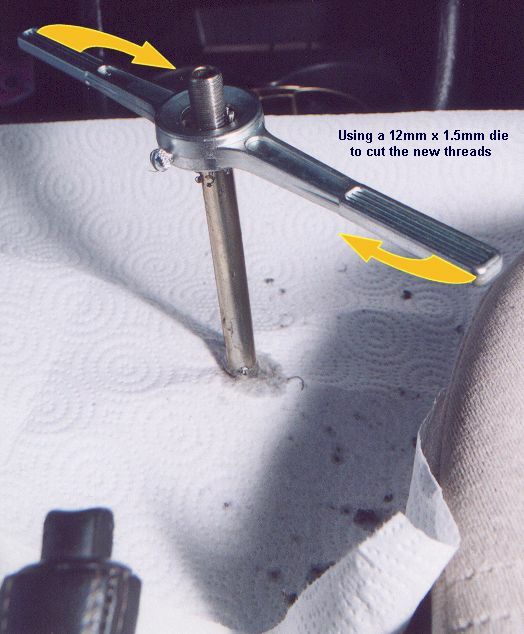 Apply cutting oil to the threads on the shifter and thread the die until it hits the bottom of the shifter threads. Begin cutting the new threads (follow the directions supplied with the tap & die kit or listen to someone who knows how to do this) down to the mark you made, remembering to back off every 1/4 - 1/2 turn to release the cut metal from the teeth. Once you've reached your mark back off the die and wipe the metal shavings and oil from the threads on the shifter shaft. It'll be difficult to see so give it your best estimate; what I did was cut until the center of the die was about where the mark would be. Because the tubing cutter will follow the threads, you will need to rotate the tubing cutter 180° clock-wise, rotate it back to the 'home' position, rotate it counter clock-wise 180°, and return it to the 'home' position. Tighten the cutter and repeat until the shaft is snipped off. Once broke free, you will need to carefully re-thread the die onto the shaft threads since the roller on the tubing cutter will have dulled them some. If you want to cut more off, just go through the whole procedure again now that you know it's pretty easy! When finished, vacuum the whole area, snap the shifter surround back on to the center console and screw the shift knob back on. Done! 1 -> 2 3.13" 2.50"